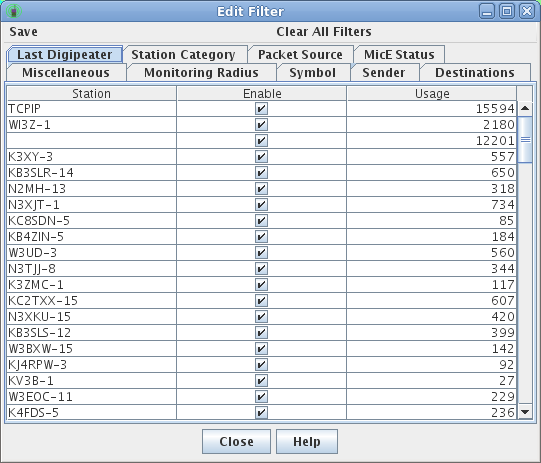 The Last Digipeater filter allows you to view only stations and objects forwarded by specific digipeaters and/or I-Gates (or by no digipeater at all). The digipeater list shows all the stations that showed up last in any message transmissions. If the message was heard directly from the originating station, the digipeater name will be blank. If that message was relayed through a station that did not implement tracing (also known as UITRACE), the last alias through which the message was digipeated is counted (since the relaying station did not identify itself). Unchecking the box for any digipeater stops the display of stations and/or objects using that particular last digipeater. Note that unchecking a standard digipeating alias will not block stations that were UItraced on their last digipeater. Clicking the column heading sorts the table by the specified column.